Front Fixed Panel: 14" Glass Door: 28" Side Fixed Panel: 38 in. Establish a brand new look for your bathroom with the Aston Langham 60 in. 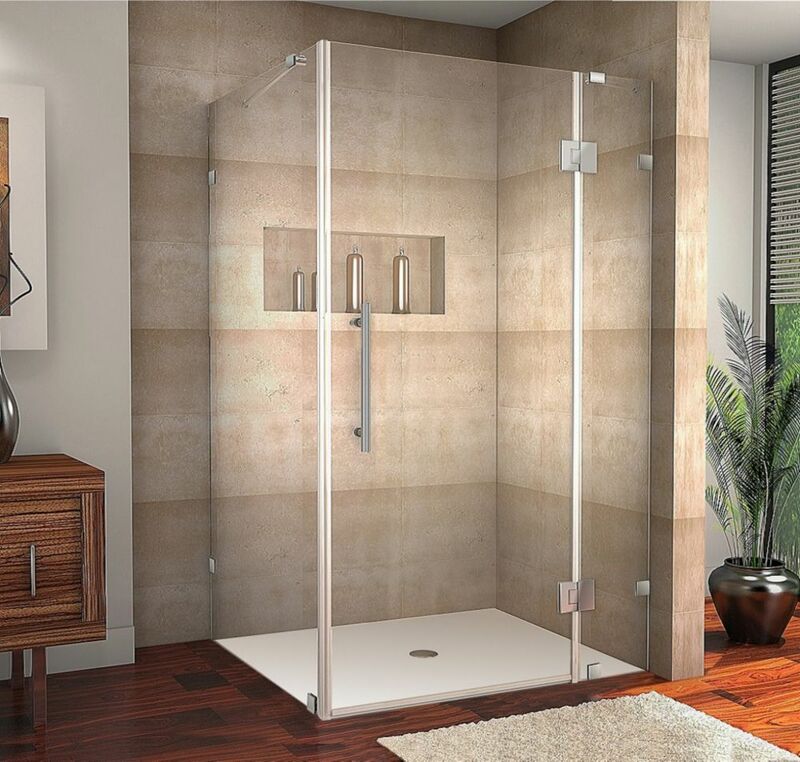 Completely Frameless Sliding Shower Door with low-profile shower base. Accentuated with stainless steel finished hardware, premium 3/8 in. ANSI certified tempered glass and deluxe full-length seal strips to prevent leakage; this European-inspired, luxurious door instantly creates a sophisticated custom-look style for your bath at a fraction of the cost. Perfect for that smaller alcove space in your bathroom. This model is engineered for both right and left handed door installation. Includes 2.5 in. low-profile fibreglass-reinforced acrylic right-drain shower base. Replace your dated tub door or shower curtain with the Aston Soleil Frameless Tub-Height Hinged Shower Door Panel. European-inspired, constructed of 6mm ANSI certified glass and complete with chrome finished hardware, the Soleil tub-height door provides your bath a completely frameless custom-look door at a fraction of the cost. This model is reversible for left or right hand installation. Transform your tub instantly with this simple, sleek model. Avalux 42-Inch x 38-Inch x 72-Inch Frameless Shower Stall in Stainless Steel The Avalux square/rectangular completely frameless hinged shower enclosure series provides a contemporary, upscale showering experience in your existing shower space. Available in a number of sizes, the Avalux comes ready to install, complete with 10mm ANSI-certified clear tempered glass, chrome or stainless steel finish with stainless steel composite hardware, Self-Centering hinges, premium clear leak seal strips and engineered for reversible left or right-hand door installation. This model includes a 5 year warranty and base is not included.